You don’t ever want to have an emergency, but a smart person is always ready for the unexpected. Like a good scout, being prepared is the best rule of thumb. If you were to have an emergency plumbing problem, would you know who to call? 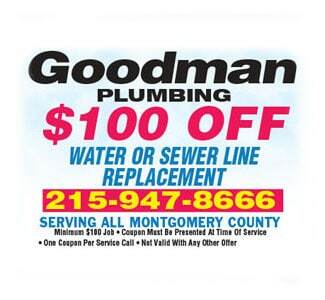 How about calling the Best Emergency Plumber as mentioned in the Best of Philly Magazine? The best plumbing crew has fully-stocked trucks always on standby, and truly cares about your problem. Need an Emergency Plumber? Call Now! 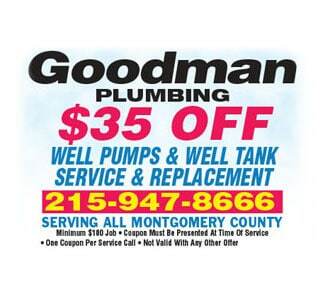 Goodman Plumbing is an expert at fixing big problems while staying calm and keeping mess to a minimum. Satisfied customers have given us a 5-star rating on Yelp, so you can feel confident you will get the best service available. By hiring a company that adheres to laws, codes and other regulations, you can feel more certain that work won’t have to be redone later. You’ll want to hire a plumbing company that has been part of the community for many years. Why go with the new guy when you can call someone with an established reputation? If in doubt, take time to read testimonials from satisfied customers, and feel free to ask the company as many questions as you like. By choosing a reputable plumber, your homeowner’s insurance may foot part of the bill. Hire a plumbing company that will work with your insurer from start to finish. Many emergencies lead to other repairs, such as replacing floors or sections of sheetrock. Such repairs can be costly, which is why you’ll want to let your insurance help pay the bill. 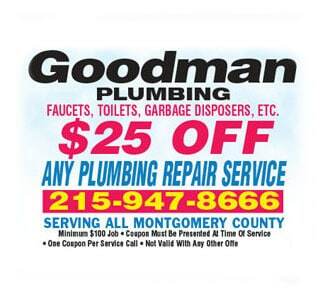 Goodman Plumbing is there for you every day of the week. Be keeping our phone number handy, you’ll be prepared for the unexpected.